The barn owl is one of the most common owls found around the world, although they are endangered in Illinois. Loss of habitat is the main cause. Varieties of barn owls can be found in polar and desert regions, mountains and pacific islands. The American barn owl has brown and reddish feathers with a white speckled font and a characteristically heart-shaped face. The barn owl is nocturnal and has excellent hearing to locate its prey. The great horned owl can weigh between 1.3 and 5.7 pounds. Its wing span can range from three to five feet. The owl has excellent vision and hearing. The distinctive ear tufts or “horns” make this largest of North American Owls stand out. 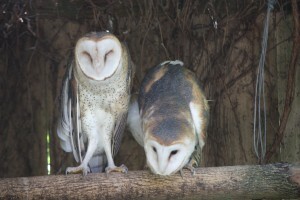 The owls’ ears are on the side of its head and are asymmetrical (one higher than the other); these allow for triangulation and pinpoint targeting of prey. The great horned owl is generally a sedentary bird and is very territorial in its nesting and hunting ranges. The owl has a very distinct, classic owl call (ho, ho, hoo, hoo, hoo). The female’s hoot is a little higher than the males. Their talons have a grabbing force of 300 psi. This comes in handy for those grab and go meals. 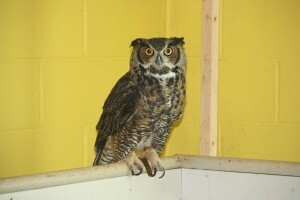 Our male horned owl, named Archimedes, was brought to us as a downy baby on March 17, 1992. 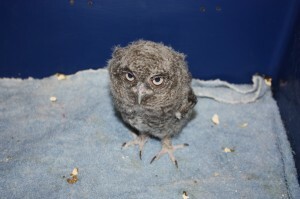 The baby owl and his sibling were found in a nest below the deck of the bridge. The bridge was being demolished, and part of the nest had caught fire from the cutting torches. Range: Across North America from southern Canada to Central Mexico. Habitat: Woodlands and nearby open areas, parks, and urban areas with trees. Size: Screech owls are 7-10 inches long from beak to tail tip. They weigh around 5-6 ounces. Females are usually slightly larger than males. Diet: Mice and other small mammals, small birds, insects, earthworms, and fish. Zoo Diet: Chicks, small rats, and mice. Life Span: To at least 13 years, although most probably live a much shorter life in the wild. Reproduction: Screech owls usually nest in tree holes, but they will also use nest boxes provided for them. They don’t carry any nesting material to the hole, although the nest often contains feathers, scraps from their prey, and leaves carried in by previous occupants. Nesting occurs from mid-March to mid-May. Three to seven (usually four or five) white, nearly round eggs are incubated by the female. The eggs hatch after 26 days of incubation, but since incubation begins before all the eggs are laid, the young owls hatch at intervals over several days. When food is plentiful, all the young are likely to survive. When food is scarce, the first-hatched owlets, being larger than their siblings, get most of the food. The smaller owlets then starve or are eaten by the larger ones. The young owls hatch covered with down and with eyes closed. Both parents feed the young in the nest for about 4 weeks. Young owls leave the nest before they can fly well or hunt on their own. The adults feed them for several weeks after the owlets are out of the nest. Characteristics, behavior, etc. : Except for the females being slightly larger than the males, the sexes are alike in appearance. Two color phases, red and gray, exist and interbreed. The red allele is dominant. Excellent vision is a characteristic found not only in screech owls, but in all nocturnal owls. Forward-facing eyes give owls good binocular vision and depth perception. However, with a narrow field of view, they can not see far to the sides without turning the head. An owl’s field of view is only about 110 degrees, compared to 180 degrees for a human and 340 degrees for a pigeon. The eyes, tubular rather than spherical, are firmly fixed in the sockets. The narrow field of view and inability to move the eyes are compensated for by a very flexible neck. Owls can turn the head through a 270 degree arch in each direction. Owls can not see in complete darkness, but they can see in very dim light that would be total darkness for humans. Owls also see very well during the day. Owls have excellent hearing. The two ear openings, bordered on one side by fleshy movable flaps, differ in size, shape, and relative placement on the sides of the head. One opening is larger and higher on the head than the other. This allows an owl to determine the direction a sound is coming from. Owls also move the head up and down and side to side to help pinpoint the origin of a sound. Flattened facial discs of feathers help funnel sounds to the ear. On the other hand, the ear tufts at the top of the head are not involved in hearing at all, but rather are important in social displays. Owls move quietly, for sensitive hearing would be much less useful if the owls were themselves noisy, drowning out the faint squeaks and rustling sounds made by mice and other potential prey. The screech owl is virtually noiseless while flying. Soft body feathers, covered by a fluffy, downy layer, muffle any flapping sounds. Flight feathers at the front edge of the wings have many serrations, giving them a frilled look and silent movement. The feet are also covered with feathers. Screech owls swoop down noiselessly on their unsuspecting prey. Screech owls usually catch their prey with the feet. The 4 toes on each foot have needle-sharp talons. The talons also serve as defensive weapons. A cornered screech owl sometimes leans on its back, directing the talons at its attacker. Of the 4 toes, two are directed forward, one to the side to widen the foot’s grasp, and one backwards. The toe to the side can be shifted forward or backwards to facilitate perching. The skin on the underside of the toes is rough, aiding the screech owl in picking up slippery prey such as earthworms. The screech owl’s beak is small and placed low on the face where it won’t obstruct the bird’s vision. Small prey are swallowed whole. Larger food items are held with the feet and torn apart with the beak. While feathers are often plucked from a bird before it is eaten, most other prey parts are eaten. After stomach juices digest the fleshy parts, undigested bones, insect exoskeleton, fur, and feathers are regurgitated in a pellet, the harder parts neatly wrapped inside the softer ones. By studying owl pellets, biologists can determine what wild owls are eating. Screech owls hunt in two ways: while flying or by watching for prey while perching. Prey are usually caught with the feet, but the beak is sometimes used to catch insects on the wing. The long bristle-like feathers around the beak act as an insect net, funneling insects toward the beak. Screech owls feed on a great variety of prey, depending upon what is most available. At times, insects are the predominant food. At other times, small birds or rodents are more important. Screech owls begin hunting at dusk. During the day, they rest in a tree cavity or perch on a limb. When approached, a perching owl will slowly stand up, press its feathers tight against the body, lift the ear tufts, and squint the eyelids down to slits. With its streaks of gray or brown color, the well-camouflaged owl looks much like the broken stub of a branch. Screech owls are the most abundant owls in Illinois. They are very adaptable, eating a wide range of prey and nesting in many kinds of tree cavities, holes in building, and artificial nest boxes. They are common in many residential areas. The screech owl is poorly named, because its call is not a screech. The owl makes a whinnying sound or tremulous whistle. We have several Screech owls at Scovill Zoo. Some Screech owls are used for our mobile zoo programs; others are on display by the red panda exhibit south of the concession stand.